A few of my friends and I are in between gigs like many people nowadays. My friend, David, decided to christen Friday – Adventure Friday. This past Friday we opted to go to the Bowl and see if we could catch Berlin, the B-52s or any of the other bands rehearsing. We got there only to find that it was the sound check people on stage. After suggesting a few Hollywood restaurants to the Aussie tourists we decided on the Griffith Observatory. 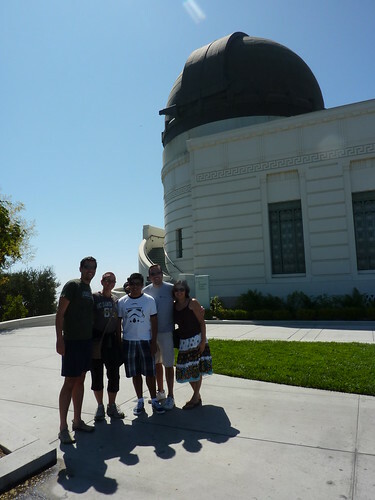 Having grown up in LA (our group of 4 actually) we all remembered how fun a trip to the Observatory can be. Half of us had not visited since the remodel. We took a mini tour of Hollywood on our way to the Observatory. We stopped at the Alto Nido Apartments where Sunset Boulevard’s Joe Gillis (William Holden) lived and Elizabeth Short (Black Dahlia). Our tour guide, David, then took us to Carol Burnett’s star and told us the story behind her star being placed in front of what used to be Pacific Theaters (saw many movies there as a kid). We ended our star tour at Julia Robert’s apartment building from the film Pretty Woman, you can see a photo here. As we drove to the Observatory we happen upon some deer. I know they are all over the park but they tend to be shy compared to the coyotes. The day felt complete at that point. Since we had started our day early the Observatory was not open yet. We decided to take in the view, but Friday was very hazy so the view was pretty limited. Hunger pangs took over and figuring out a place to eat took precedence. We had a few caveats it needed to be on within a 10min driving radius, needed to be $10 or less, and kitschy. 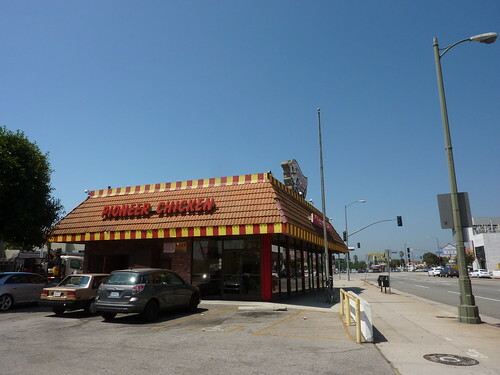 Somehow Pioneer Chicken won, I will admit I was a bit reluctant about the choice. Oddly enough it tastes just like I remember it tasting. According to a regular the items to try are the Specials (we’ll save that for another trip). Something to be said about places, things that remind you of childhood – they are very comforting.